Walt Disney was born 113 years ago today. Happy Birthday! Although born in Chicago, Walt spent less than six years living there—his first four and a half years and then one intensely busy year as a teenager. The O-Zell Company was part of Walt’s teenage years—and now it’s back in a new form. , Curator of Yesterland, December 5, 2014. 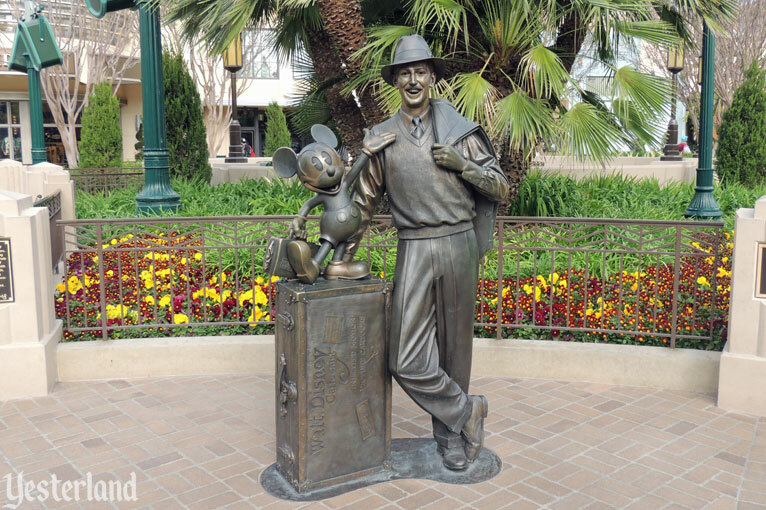 The Storytellers statue on Buena Vista Street at Disney California Adventure represents young Walt Disney arriving in Los Angeles in 1923—with far more dreams than dollars. If you’re a member of D23, you also know the significance of 1923. But what about the years before then? And where does the O-Zell Company fit in? 1901 — Walt Disney is born to Elias and Flora Disney on Tripp Ave. in Chicago, Illinois. 1906 — Walt’s family moves to a farm at Marceline, Missouri. 1911 — The family moves to Kansas City, Missouri, where Elias has purchased a newspaper delivery route for The Kansas City Star. 1912 — Elias begins investing delivery route income in the O-Zell Company, Chicago. 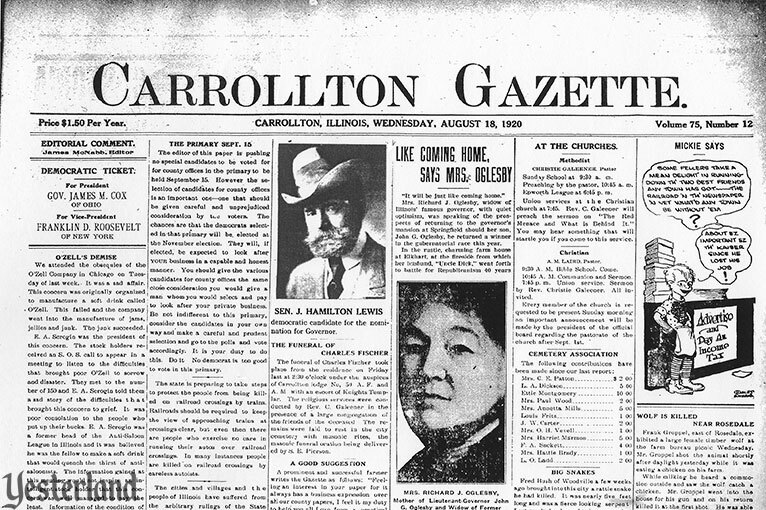 1917 — Elias sells his newspaper delivery route in the spring to take a larger ownership stake in the O-Zell Company. He and Flora move back to Chicago (but not back to Tripp Ave.) where Elias takes an active role in O-Zell. Walt joins them after working that summer as a news butcher on passenger trains. 1917-1918 — Walt attends 8th grade at McKinley High School in Chicago (his final year of formal education), works at O-Zell, works for the Post Office, works at the 35th Street elevated train station, and takes evening classes at the Chicago Academy of Fine Arts (not the School of the Art Institute of Chicago as often erroneously identified). 1918 — 16-year-old (almost 17) Walt Disney enlists in the Red Cross Ambulance Corps (not in any branch of the military), claiming already to be 17. 1919 — Walt returns to Chicago in the fall after a year with the Red Cross. He quickly moves back to Kansas City hoping to be a newspaper artist. Over the next few years, Walt works for several commercial art firms and is exposed to animation. 1920 — The O-Zell Company fails. 1921 — Elias and Flora move back to Kansas City. 1922 — Walt starts Laugh-O-gram Films in Kansas City. 1923 — Laugh-O-gram Films goes bankrupt. Walt moves to Los Angeles, California. It was because of the O-Zell Company that the Disneys moved back to Chicago, where Walt was able to take art classes. Unlike his father, Walt did not see his future working in a soft drink and jelly factory. Walt wanted to draw—and Walt got encouragement at O-Zell from an unlikely source. The O-Zell Company turned out to be a poor investment for Elias. Just over three years after he moved back to Chicago, O-Zell ran out of money. The investors’ stock certificates became worthless. It’s hard to find period sources about O-Zell. 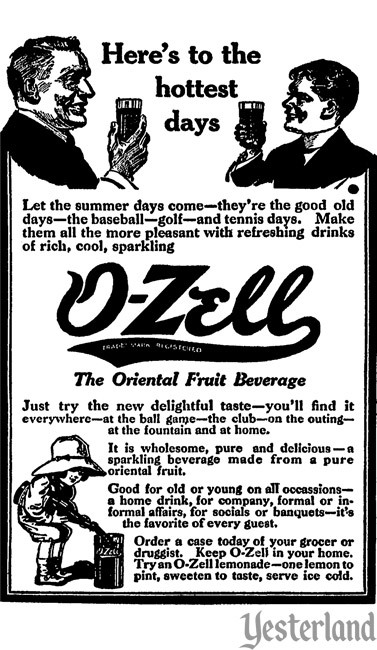 For example, although the Chicago Tribune had display ads for O-Zell beverages in 1914, it had no articles about the O-Zell Company’s efforts to establish itself or about its demise—at least none that are indexed by ProQuest’s Historical Chicago Tribune Database. Apparently O-Zell was too small and uninteresting to warrant even short items in the Tribune business section. We attended the obsequies of the O’Zell Company in Chicago on Tuesday of last week. It was a sad affair. 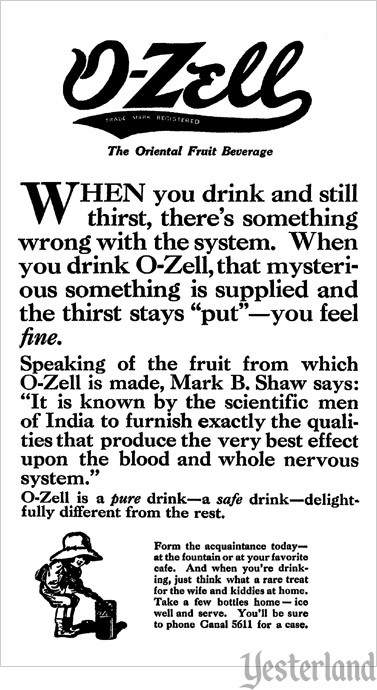 The concern was originally organized to manufacture a soft drink called O-Zell. This failed and the company went into the manufacture of jams, jellies and junk. The junk succeeded. E. A. Scrogin was the president of this concern. The stock holders received an S.O.S. call to appear in a meeting to listen to the difficulties that brought poor O’Zell to sorrow and disaster. They met to the number of 150 and E. A. Scrogin told them a sad story of the difficulties that brought the concern to grief. It was poor consolation to the people who put up their bucks. E. A. Scrogin was a former head of the Anti-Saloon League of Illinois and it was believed he was the fellow to make a soft drink that would quench the thirst of anti-saloonists. The information gained at this meeting would not inspire an intelligent stock holder that this concern was well managed to say the least. Information of the condition of this concern was refused stock holders and by streonus [sic] efforts very unsatisfactory information was gotten on mourner’s day on Aug. 10. It owed $250,000, it was said, and had scant assets unless it was a “going concern”. As it was a “gone concern”, the assets would not pay out and the end was inevitable. Thou hast gone to hell. Why would the editor of a small newspaper travel 270 miles to Chicago “to attend the obsequies [funeral rites] of the O’Zell Co.” [which he wrote with an apostrophe instead of a hyphen]? According to ads in the Carrollton Gazette, James McNabb also had a law practice. Perhaps he went to represent law clients. Or maybe McNabb was a shareholder. Getting a newspaper column out of it may just have been a bonus. I took another look this year. The address of the O-Zell Company was 1301 W. 15th Street in Chicago. That would put it at the southwest corner of W. 15th Street and S. Throop Street in Chicago’s University Village - Little Italy neighborhood just southwest of downtown Chicago. 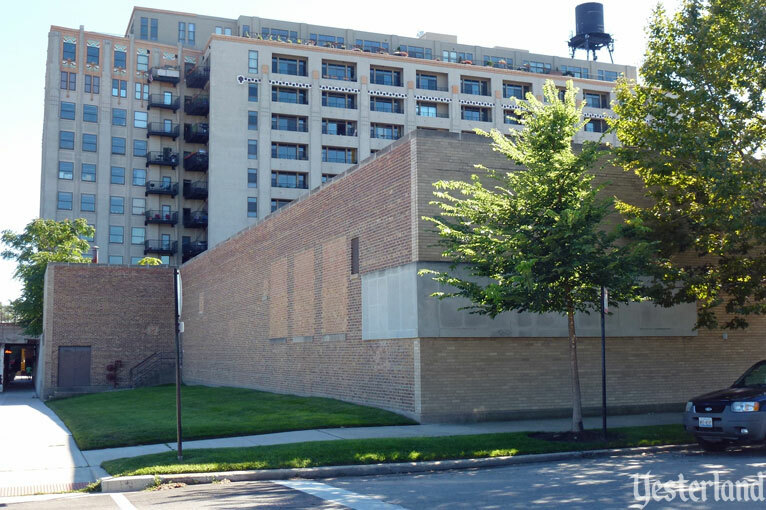 The address is now a rectangular patch of grass—although the O-Zell Company’s building may have had a wider footprint. By the way, the immediate area keeps improving. The high-rise in the background was the Produce Terminal Cold Storage Building, built in 1928. It became University Station, a residential condominium building, in 2006. A new Costco opened a half mile to the west in 2012. 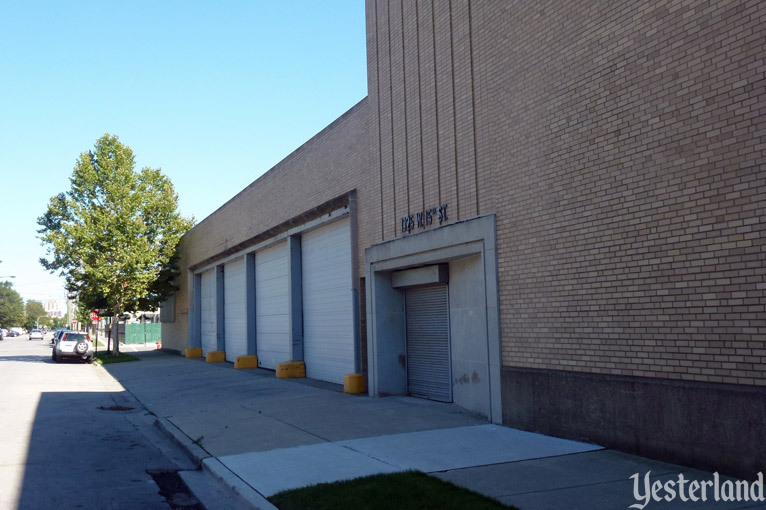 The rest of the block is an industrial building used as the headquarters of Pepe’s Mexican Restaurants, a popular chain in Chicago, its suburbs, and Northwest Indiana. The building was constructed in 1951. 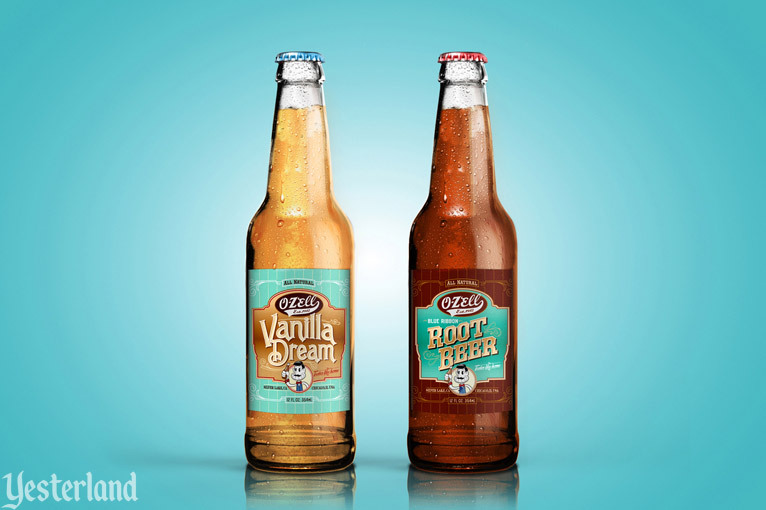 A new O-Zell Soda Company was launched in 2014. 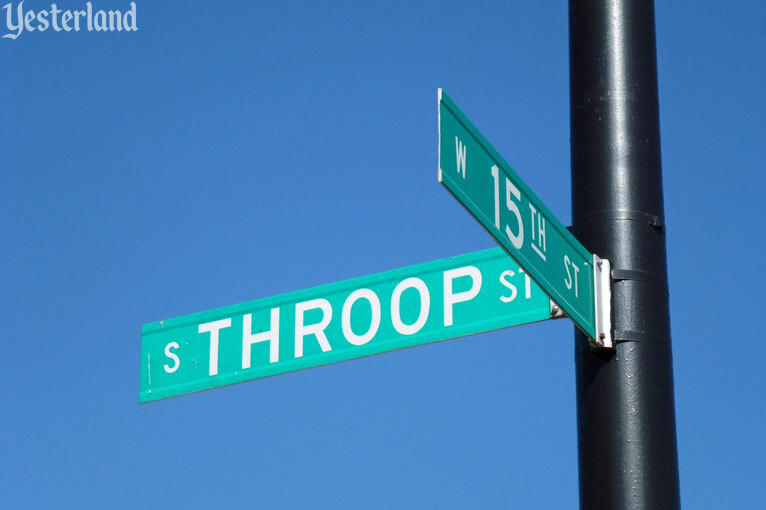 Although it’s not made at the corner of W. 15th Street and S. Throop Street, there are once again connections to Elias Disney and Walt Disney. A caricature of Elias Disney is on the label. All profits go to restoring and preserving Walt Disney’s Birthplace home in Chicago. 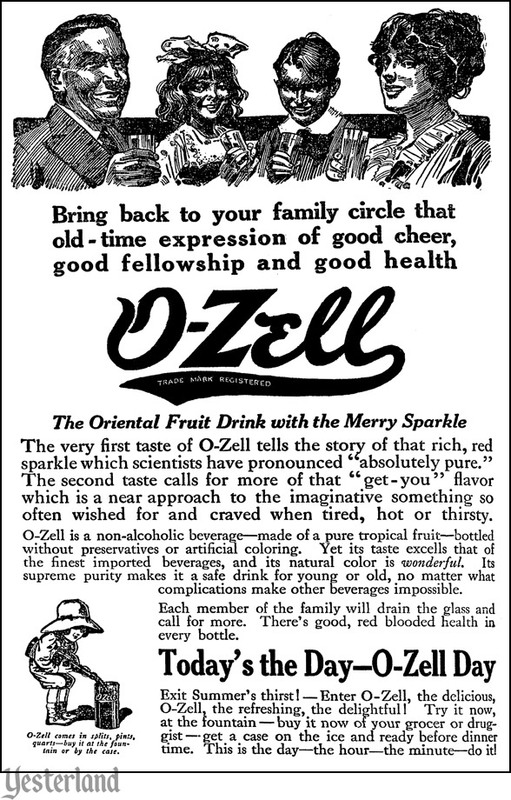 Visit The O-Zell Soda Company. It’s a fun website. The final three photos in this article are all from December 4, 2014. Thanks to the support of the Disney fan community, Phase One of the restoration is now well underway. 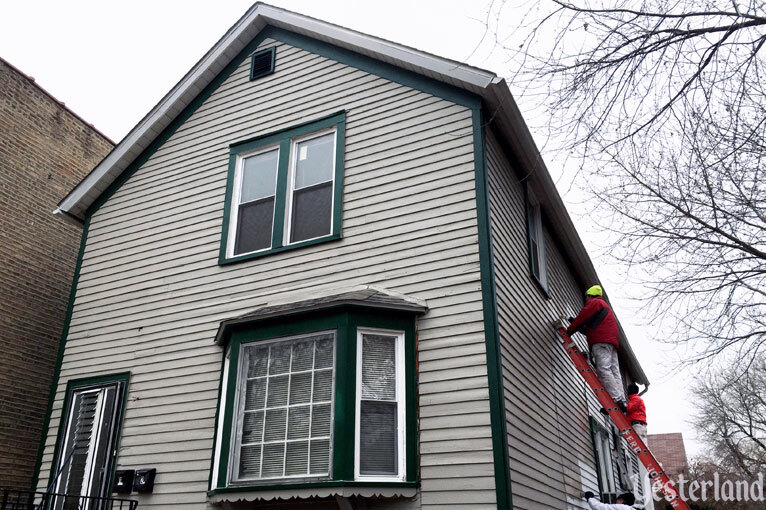 The original siding has a much-needed coat of paint to protect it. The colors are based on a paint and finish analysis conducted by Historic Preservation graduate students at the School of the Art Institute of Chicago. The students performed microscopic analysis on layers of paint from various spots on the house. With the goal of accurately turning the calendar back to 1905—the house’s “period of significance”—the decision by the experts leading the project was to go with historically accurate shades of warm gray paint for the clapboarding and dark green paint for the trim. New steps lead to the front door—but the door itself still needs to be replaced. The current bay window is from the 1960s. The second floor front window was originally centered. All windows will be replaced with historically accurate windows in their original locations. The Phase One Restoration fundraising campaign is a success. 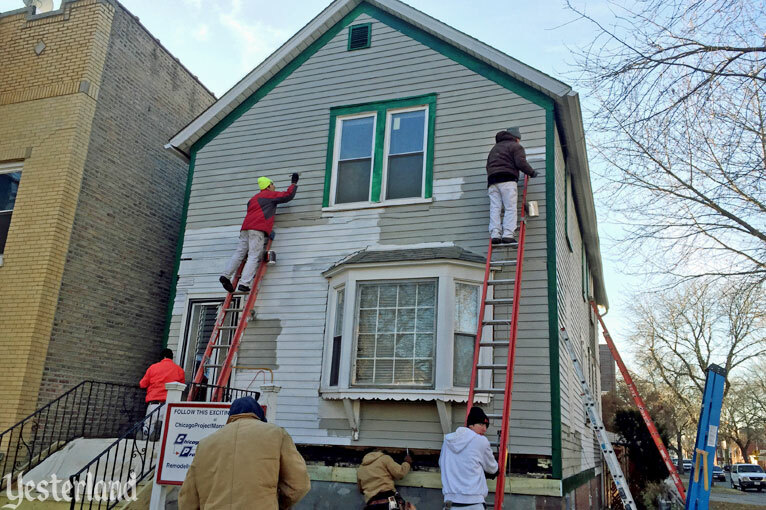 The initial goal was $40,000 toward exterior work. As of midnight Central Time, the beginning of Walt Disney’s 113th birthday, 307 backers have pledged $47,682. Yay! That means $50,000 is now in reach! If you haven’t already become a backer, please act quickly. December 5—the day this article is being published—is the final day of Phase One fundraising. You can pledge as little (or as much) as you want. There are terrific premiums for backers. Premiums begin at $10. 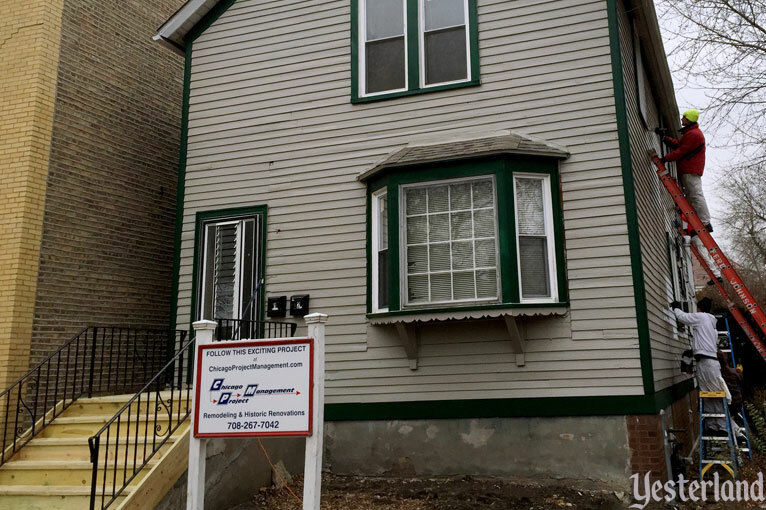 To learn more about the restoration plans, visit the official website of The Walt Disney Birthplace.